Bloatware can be removed using decrapifier. Free upgrade to Windows 10. Made for multimedia, the Lenovo Z70 is a stylish big screen laptop packed with power. Featuring a 17.3-inch Full HD display, fifth generation Intel processor, NVIDIA graphics and audio from Dolby and JBL, this stunning laptop has everything to become a complete entertainment system, whether you're streaming HD movies or playing the latest games. A massive 16GB of RAM combined with Intel’s 5th-generation Core i7 processor will give you enough power to breeze through almost any task you throw at it, even with multiple windows open. With the NVIDIA GeForce 840M, you'll be able to enjoy entry level gaming and stream smooth HD videos. It features NVIDIA Optimus technology, which ensures you'll get high performance when you need it and longer battery life when you don't. The large 17.3" screen outputs at a resolution of 1920 x 1080 pixels, or in other words, Full HD. With anti-glare technology, it's brilliant for enjoying films or tackling games, even in bright sunlight. The dual JBL-designed stereo speakers with Dolby Home Theatre v4 speakers combine to deliver an increased level of audio clarity and maximised volume output without distortion. Navigate your computer using gestures on the Intelligent TouchPad. With this facility, you’ll find yourself accessing programs and documents with more speed and efficiency than previously possible with just a keyboard and mouse. The huge 1TB hard drive will give you plenty of room to store documents, pictures, music, videos and more, as well as all of your installed programs. Connect with your other devices using the HDMI, USB 3.0 and USB 2.0 ports. Use the HDMI to output to a TV or monitor with HDMI in to show off your pictures, videos and work on a bigger screen. A quad core would have been better but looks pretty good nevertheless. Yeah surely a quad core processor, a better graphic card, a ssd would be better but this looks good for the price. Yeah surely a quad core processor, a better graphic card, a ssd would be … Yeah surely a quad core processor, a better graphic card, a ssd would be better but this looks good for the price. It's a shame, but there are not many alternatives apart from this for £550! To be fair this is a 17" laptop, they are not made to be very portable. Can I get any input from some of you PC nuts on my question over in the ask section please, thanks. Amazon price match (3 left). I wonder whether I can replace the DVD drive with an SSD. The CPU is quite a downer though. Going by the budget I'm assuming that your needs are just to browse the web, maybe little office work and watch some videos which means hard drive space isn't really a deciding factor here. Argos one really does have a **** poor processor (essentially from an Atom family tree that you see in tablets) and that's one part of the laptop you can't upgrade. Tesco one is also a 13" screen vs 15" on the other so decide how important that is to you. I would go for Toshiba, however, that is with the knowledge that I would be sticking a 4GB RAM module (£15 to £20 on Amazon) straight out the box as 2GB would be bordering unusable. This process is as easy as unscrewing a few screws and sticking in a cartridge like in the good old Sega Mega Drive days. If you're not afraid to further upgrade the hard drive to SSD for around £40 that would bring it to the price of the Argos one, but you would have a significantly faster machine to play with. Going by the budget I'm assuming that your needs are just to browse the … Going by the budget I'm assuming that your needs are just to browse the web, maybe little office work and watch some videos which means hard drive space isn't really a deciding factor here. Argos one really does have a **** poor processor (essentially from an Atom family tree that you see in tablets) and that's one part of the laptop you can't upgrade. Tesco one is also a 13" screen vs 15" on the other so decide how important that is to you.I would go for Toshiba, however, that is with the knowledge that I would be sticking a 4GB RAM module (£15 to £20 on Amazon) straight out the box as 2GB would be bordering unusable. This process is as easy as unscrewing a few screws and sticking in a cartridge like in the good old Sega Mega Drive days. If you're not afraid to further upgrade the hard drive to SSD for around £40 that would bring it to the price of the Argos one, but you would have a significantly faster machine to play with. Thanks, I have gone with the ebay one and I was going to put more ram in to it, I did see that it may already have 6gb in there because of another thread posted on here & Tesco had got it wrong about it being 2gb. How is it a rebadged i3 may I ask? Yeah this marketing use of i7 is getting annoying particularly for a ULV CPU. I mean after cashback it's not a bad price but this is more of a multimedia machine, even a slightly more decent dual core CPU would turn this into good bang for buck budget gamer. Yeah this marketing use of i7 is getting annoying particularly for a ULV … Yeah this marketing use of i7 is getting annoying particularly for a ULV CPU.I mean after cashback it's not a bad price but this is more of a multimedia machine, even a slightly more decent dual core CPU would turn this into good bang for buck budget gamer. Intel ditched that idea and decided to muddy it up and rebadge their processors to make them sound better than they are. I have a Dell Inspiron 17R SE Laptop and that has a true i7 processor - Core i7-3610QM (Quad Core + HyperThreading). Its a few years old now but its put me off buying an i7 laptop now, especially since i diddnt pay much more than this for it. £650 for an underpowered ULV processor and a low/mid range 840m GPU?? Only complete noobs would buy something like this. £650 for an underpowered ULV processor and a low/mid range 840m GPU? ?Only … £650 for an underpowered ULV processor and a low/mid range 840m GPU? ?Only complete noobs would buy something like this.ICE COLD. If you have a clear idea of what you're looking (avoiding the the noob clickbait) and hunt around, there are usually deals out there. Prices on a lot of laptops tend to fluctuate up and down. 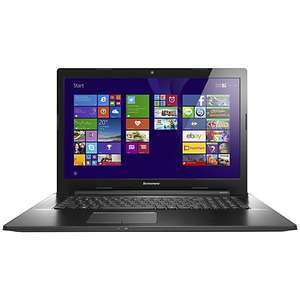 … http://www.johnlewis.com/lenovo-z50-laptop-intel-core-i7-8gb-ram-1tb-8gb-sshd-15-6-/p1857170?navAction=jumpIs this a good alternative? The z70 has the newer processor, slightly better graphics card and twice the memory. So the z70 is probably the better deal. All depends on what you're looking for and what you want the laptop to … All depends on what you're looking for and what you want the laptop to do. If you're looking for a fairly powerful 15.6", I posted a couple of deals recently:http://www.hotukdeals.com/deals/msi-ge60-apache-15-6-core-i5-4210h-2-9ghz-3-5ghz-8gb-ram-nvidia-geforce-gtx-850m-2234979http://www.hotukdeals.com/deals/lenovo-y50-70-15-6-core-i5-4210h-2-9ghz-3-5ghz-8gb-ram-nvidia-geforce-gtx-860m-1tb-2235850If you have a clear idea of what you're looking (avoiding the the noob clickbait) and hunt around, there are usually deals out there. Prices on a lot of laptops tend to fluctuate up and down. Amazing price for the y50, but ex demo put me off, shame as some people got like new units. Can I get a knowledgeable persons opinion on another lenovo in john lewis. Does the following have a proper SSD to speed up boot? It has a hybrid drive - part of it (8gb) is SSD and the remaining part (1TB) is a mechanical hard disk. The firmware (computer chip) inside the disk drive decides what data goes on the SSD part and what goes on the HDD part, the theory being, that files which are used often go on the SSD part. From the user perspective, all you see is one drive. In short it's faster than a HDD but not as fast as a full SSD. Personally, I'd suggest going for one of the Asus multimedia 17" laptops such as the N751. Much better all round quality than either Lenovo and as long as you get the IPS version, the screen will be much, much better than the Lenovo's. what's with the 'bad download speed' comment on the JL site? that guy just get unlucky or his fault? It has a hybrid drive - part of it (8gb) is SSD and the remaining part … It has a hybrid drive - part of it (8gb) is SSD and the remaining part (1TB) is a mechanical hard disk. The firmware (computer chip) inside the disk drive decides what data goes on the SSD part and what goes on the HDD part, the theory being, that files which are used often go on the SSD part. From the user perspective, all you see is one drive. In short it's faster than a HDD but not as fast as a full SSD.Personally, I'd suggest going for one of the Asus multimedia 17" laptops such as the N751. Much better all round quality than either Lenovo and as long as you get the IPS version, the screen will be much, much better than the Lenovo's. thank you for that, will hold off the Lenovo for time being and wait for a few weeks. what's with the 'bad download speed' comment on the JL site? that guy … what's with the 'bad download speed' comment on the JL site? that guy just get unlucky or his fault? Just sounds like a fool, he also put a review on Amazon. or could it be a single band wifi board, so no dual-spectrum speed potential?